Kai might be a medieval knight or a modern surfer. Thanks to Clio for choosing our Baby Name of the Day. Back in the earliest tales of King Arthur and the Knights of the Round Table, we find Sir Kay, foster brother to the king. Sometimes he’s brave and loyal; later takes make the character boorish. His name changes, too. Over the years and languages, Kay becomes Caius, Keu, Kes, Kex, Kei, Cai, and yup, Kai. Caius suggests a link to the Latin Gaius, as in Gaius Julius Caesar. Or maybe the similarity is coincidental. This dates the name to the tenth century or so. Cai remains in use as a masculine name in Wales. It might also be short for Cornelius, Nicholas, and other longer names. Credit for the nickname’s evolution often goes to Frisian – a group of languages spoken in Germany and the Netherlands. It might connect to the Frisian word kaimbe, meaning warrior. As with Gaius, it’s not clear if it explains the name’s roots, or is just coincidence. Farther north, the name is also spelled Kaj and Caj. Danish writer Hans Christian Andersen. The Danish author penned “The Snow Queen” back in 1845. It goes like this: the devil himself crafted a mirror to distort reality and make us see the world as ugly and cruel. It shattered into millions of pieces, and now we can get splinters in our eyes and hearts. Best friends Kai and Gerda grow up as close as siblings. But as they grow, Kai falls victim to the splinters, and is taken captive by the Snow Queen. His family believes he has died, but Gerda never gives up. After an epic journey by reindeer, she finds him in the Queen’s permafrost castle, and frees him with her love. I’d heard that Disney was making an adaptation of the fairytale. It could be a huge boost for Kai! Except it looks like Frozen is a complete reinvention of the story, with no character by the name. As it turns out, Frozen did give us a Snow Queen, and a reindeer, and a rescue based on love. But the rest of the story is very different indeed. But the name didn’t need a Disney boost. Cajetan, ultimately from Caieta or Gaeta, the name of a town in ancient Italy. Depending on the kanji, it might mean ocean or earth in Japanese. Along the same lines, in Chinese, it could mean victory. And, of course, the sound brings to mind boys’ names from 90s favorite Kyle to the Biblical Malachi. Despite these international ties, the name is linked strongly to Hawaii, where it means sea. It appears in compound names, masculine and feminine, like Kainoa and Kailani. That makes it a nature name, in the same category as River. It rose in the 1950s, when Kai Winding, a Danish-born jazz musician, rose to fame. He recorded Time is On My Side before the Rolling Stones. But here’s a better answer: in 1959, Hawaii became the 50th state. Pop culture took notice. Elvis starred in Blue Hawaii in 1961, followed by two more movies featuring the singer donning leis and cavorting on beaches. A handful of television shows were set there during the 1960s, too. Then came Hawaii Five-O, a major prime time phenomenon from 1968 through 1980. None of them gave us a leading man by the name. There was a Hawaiian actor named Lani Kai – born George Woodd – who had a role in everything from Blue Hawaii to Hawaii Five-O. And the word for “sea” is hard to avoid, appearing on the fringes of place names and in character names. I suspect, as more Americans vacationed in the new state or served at the island’s multiple military bases, Kai started to sound more familiar and accessible. By 1979, the name had tipped into the Top 1000. At the time, Kyle was a fast-rising Top 100 boys’ name. Celebrities embraced the name for their sons. NPR journalist Kai Ryssdal has kept the name in the spotlight. Ninjago includes an animated ninja by the name, too. Television characters abound, including The Vampire Diaries‘ baddie Malachai “Kai” Parker. It’s gently trended unisex over the years, too. That’s consistent with the name’s use in Hawaiian, as well as recalling Kylie and Kyla. Kai belongs with the Sweet Spot names. It’s not too traditional, nor does it feel invented. And while the name continues to rise in popularity, it’s still far from the Top Ten. It makes for a great, modern choice for a boy. International, but still casual, Kai feels at home on a surfboard. And yet the name could suit anyone, from a noble knight to a 21st century world traveler. What do you think of Kai? Would you consider it for a son? First published on October 2, 2013, this post was revised substantially and re-published on January 30, 2019. We have a Tobias and a Malakai, who often goes by Kai or Kaister. 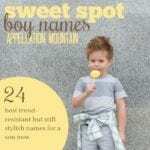 Love this name, I appreciate your blog posts! I found out the other day that kai is is a word for good in Melpa(a tribe in Papua New Guinea). My husband picked as a middle name for our baby that I miscarried. There was a minor character in Frozen named Kai. He was a servant. My son’s name is Caius, often called Cai. My husband found the name in a Jack Whyte novel. Different spelling, but there’s an athlete in Australia who competes in ironman events named Kye Hurst. 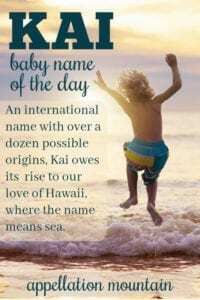 My friend named her son Kai after him, and because she loves the ocean (ex Surf Life saver). 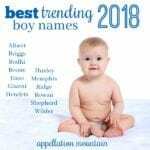 Somewhat confusing though is that people are using the name Kaidon for their little boys, which is pronounced with Kay as the first syllable, to rhyme with Aden. I’ve always been fond of Hezekiah, with Kai as a nickname. I’ve met a female Kai too – it makes a great name for boys and girls. 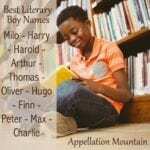 I’ve been seeing the name online but never met a boy with the name. Is there more than one pronunciation: kay? ky? key? I’ve been thinking it’s like Ky (just heard of a baby named Kyson), but always called Sir Kay, Kay (like May), and I’ve also come across a pronunciation of the name as key. I’ve only ever heard Kai rhyme with sky. I know two, plus there’s the Ninjago character and the NPR journalist. I’d say it is the dominant pronunciation in 21st century America. Other countries, I’m not so confident. And I’d hesitate to guess about the knight. You’re right – I tend to call him Kay, rhymes with day, when that spelling is in use. I think in the US, we tend to see Kay and say the letter sound. But in Australia, there’s a town called MacKay, and it’s pronounced McKYE. So I think maybe Kay/Kai are closer than we Americans might think. Now that’s interesting – thanks, Kim! My grandma born in Friesland and they used Kai as a nickname for Gerhard/Gerrit (her brother’s name) in addition to Nicholas and Cornelius. I have all three names in that branch of my family tree, so I considered it for my son. Now I can’t remember why I stuck from my list, but it was probably it’s burgeoning popularity. Shhh. The hero of my novel-in-progress is called Kai…I want his name to still sound fresh by the time the book is finished! Alas and alack, too late. The hero of my 2012 book was Kai, and before it hit stands, there was another “Ky” and another “Kai” in books in my genre making waves. Still, I got a lot of “how is it pronounced” and “I kept saying Kay.” You can never win, baby name nerds. I had a college classmate with this name (and he was from Hawai’i) and i have loved it ever since. It’s definitely on my shortlist. 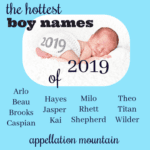 I’m definitely a fan of softer names for boys (Luca, Milo, Miles)- I wish there were more boy names like Kai. Although I like Kai, it’s unusable for me personally because of an extended family member with a similar name. By the way Abby, is that your Clio who suggested the name? I quite like it as a nickname for Malachi, though I can’t decide how the nickname should be spelt. A friend has just scooped that name on me, too.